It happened again today. I got a call about “it.” Specifically, the lady wanted to know how much “it” was. What was the “it” she called about? Well, she said she had a “simple” bankruptcy case and wanted to know how much “it” was. That’s it–pardon the pun–just how much “it” was going to cost for her “simple” case. I have a confession to make. When I get calls like this, it bothers me. And I’ve decided to tell you why calls about “its” cost bother me so much. Each case is unique. I said this so much when writing content for my bankruptcy site, one of my friends said, “you’ve said ‘each case is unique’ several time in here. Maybe you should replace it with something else. '” Well, I didn’t. Why? Each case is unique. And repetition aids learning. Did I mention that each case is unique? Do you really want me to treat your case just like everyone else’s? You’re up to your eyeballs in debt, right? Can’t sleep? Maybe fighting with your husband? Stressed out? Fixing this financial mess is something you want done right, isn’t it? Why should I assume your case is a “routine” case when I know nothing about it? Huh? Well, think about that a minute. How much is a car? Hopefully, you get the point. Is it a big car? Little car? New one? Used? Or perhaps a truck like I drive? V-8? Fuel efficient? Oh, and how many doors? I forgot to ask. What will you use the car for? See what I mean? How can I tell you how much I’ll charge you for your bankruptcy on the phone? Will it be a Chapter 7? Or a Chapter 13? Is there a business involved? Exemption problems? Over median income? Under? Do we have to run the means test? Will you pass? Will I have to spend more time making sure you have all available expenses counted on the means test? Or should I just throw you in a Chapter 13 because I don’t want to spend time on your file since you were so concerned about the cost of “it”? You get the picture–I hope. But She Said She Had a “Simple” Case! And maybe she’s right. But is she qualified to know if her case is simple? It’s like me saying, “hey, doc, it’s really simple surgery” with a quick “how much is it?” thrown in. Seriously though. How would a client be qualified to analyze their own bankruptcy case and conclude that he has a routine, simple case? How would the client know? Yes, sometimes the client might be right about the case being simple. And sometimes I make good stock picks, too. Everyone gets lucky from time to time–even me with my stock picks. I know money’s tight. I’m sympathetic to your situation. But you have a boatload of debt, right? Why should someone with $97,000 of unsecured debt really concern themselves with what their bankruptcy lawyer charges? Let’s say the total cost of the attorney fee, filing fees, and other costs is $3,000–maybe you have some issues in your case requiring extra attention. Now let’s think about this a minute. You owe the credit industrial complex–as one of my friends calls it–$97,000, and you’re concerned about the $3,000 fee, why? You want the debt GONE. You want an attorney who’ll spend the time with your file so that absolutely everything will be done to get you out from under this mountain of debt. Why would you choose an attorney on price? There’s a Lot of Work in Any Bankruptcy Case! Even with a simple bankruptcy case–one that really is, relatively, simple–there’s a lot of work for your bankruptcy lawyer to do. And then there’s his secretary and paralegal; they do lots and lots of work, too. Hours and hours and hours of work. Picking bankruptcy lawyers based on fees is a bad idea. I do quote a fixed fee for my clients. But I only do this after I evaluate their cases carefully. So please don’t call me and ask how much “it” is! Oh, and did I mention that each case is unique? I couldn’t agree more with this article. I am a bankruptcy attorney in Las Vegas and it seems like everyday I get the phone call(s) purely asking “how much does ‘it’ cost.” Some people laugh at me when I tell them each case is unique but my fees range from X to Z. 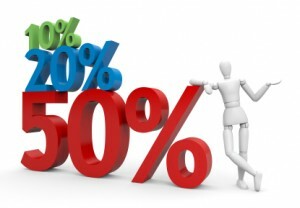 Attorneys in Las Vegas are chargin as low as $500 but unfortunately the client is getting what they pay for. Only if a client would realize the difference between a bankruptcy “mill” and a personalize service. A paralegal can only do so much. Thanks for your comments, Randy. Thanks for reading. Excellent article Russ and I think your sentiments would be echoed by about 98.5% of the consumer bankruptcy attorneys out there. I am a bankruptcy attorney in Northern Virginia and this very topic was discussed about 1 month ago by a bunch of bankruptcy attorneys in this area. I like to emphasize that beyond the “you get what you pay for” mantra is the fact that you have to keep in mind that “it’s not just getting to the finish line, but HOW you got to the finish line.” Will your attorney promptly return the inevitable 13 phone calls/emails that you will have? Will the attorney do a good of keeping you in the loop and explaining things to you? Will you like working with this attorney? Will you ever see your attorney again after hiring him or will the paralegal take over…etc. Will the process be made pain free for you in other words? It is frustrating because most clients have not filed bankruptcy before so they have nothing to compare the process to. Many think we are all the same. Anyhow, I plan on writing on this topic as well on my blog and hope that you won’t mind if I make refernce to your article? Thanks for your comments, Robert. I would be happy to have you reference the post. Look forward to meeting you some day. If you are ever in Charleston, please look me up. Outstanding article. I can’t stress how many times I have had a near exact conversation with clients. Thanks for articulating this so well. Great read. I am a client and I can tell you first hand my case is so unique we were asked to consult with the FDA on how to proceed since no one was familiar with our business circumstances. However, those filing for a bankruptcy are obviously concerned about money and significant debt. Why wouldn’t they be concerned how much they will be charged in legal fees to file for bankruptcy. It is ridiculous to think someone who is facing financial ruin would not be worried about how much a lawyer will cost. If a bankruptcy is not approved, then that person has legal costs on top of the mountain of debt. I hope more lawyers are sensitive to the horrific situation their clients and potential clients are in. Those who don’t care should face the same situation themselves- a little karma seems fair. I must tell you that I enjoyed your article. I am a bankruptcy attorney in Las Vegas also and go through this torturous question all the time. It does not mean the caller or the potential debtor are uncouth, “this how much” is part of their live. It is also part of our consumer culture. As regard to their “simple case”, nothing is simple, and each time I attend the trustee’s meeting, these “simple” cases are blown away because they were done by the paralegal who just type up the paperwork. Bankruptcy is a complex thing. One can to the pharmacy and buy over-the-counter drugs for simple ailment, but if he is more complex issues, he needs to see a doctor and get a prescription. That basically is the difference. Again, lots of attorneys have advertised their very cheap rates, and basically they are doing what paralegals are doing. Whole sale generic filling up of form, with lots of exceptions. What happens they leave the client if there is any complex situation arises, and client is again at the mercy of paralegal or doing it in proper. Do the typing agencies tell them how to safeguard a legal interest or personal injury interest, or tell the difference between an exempt and non-exempt asset or the difference between “surrender” “redemption” and “reaffirmation”. Of course, they are very important aspects of bankruptcy, and arises in the very so-called simple cases. Basically, I tell the client come to my office for a free consultation which I dutifully provide to them. Once they like me, and I too like them, many of them sign up. The fear has to be gone from the attorneys, and once they see you as humane and considerate person, they sign up for your services. I also found out “the how much” is a continuous phenomenon and it is a losing battle to fight over the phone. Once you are able to bring them to your office, the differences can be bridged easily. You’re missing the point. There’s nothing “sensitive” about having a cookie-cutter approach to pricing legal services. It just leads to treating all client’s the same and ignores the reality that price needs to be commensurate with the amount and complexity of work. I’ve had my own share of financial problems. I’ve never defaulted on a loan or filed bankruptcy, be I supported a wife and baby during law school and paid for it all by working and taking out student loans. I’ve also run a business since 1995, and for those 18 years had to make payroll every two weeks. The point of the post is not that price is totally irrelevant, but that the main concern should be quality of representation. Clients should also understand that asking “how much is it?” is like calling a car lot and saying “how much is a car?” Of course, it all depends on what’s needed. And with bankruptcy, the cost of the attorney fee is almost always miniscule to the benefit the clients get. Thanks for your comments, Malik. I don’t know how many times I’ve said to my paralegal, “This one was supposed to be an easy one!” when it was anything but easy. Nice Article Russ, Most of bankruptcy attorney take low charges because they have lack of knowledge about Chapter 7 and Chapter 13 Bankruptcy.